Anthurium flowers are ideal for planning a December wedding because of their year round availability. The exotic appearance and striking colors of the anthurium flowers make them great eye-catching blooms, no matter where they are used. As centerpieces for each of your tables, or in bouquets for the bride and bridesmaids, you can’t go wrong with Anthurium as the flower for your wedding. Alternatively, as cut flowers they are cultivated for their long vase life of 10 to 45 days. They blend well with other tropical blooms such as orchids, bouvardia and proteas to make up beautiful vase arrangements. The Anthurium flower is red and heart-shaped with leaves that are waxy and smooth to the touch, showing a healthy and fresh look throughout their above average vase life. Available in vibrant colors like pink, green, hot pink, red, brown and white. 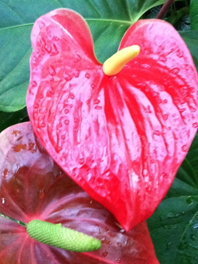 To be noted is that Anthurium, also called the flamingo flower because of its shape and color, is sensitive to the cold. Exposing them to temperatures below 55F will cause them to lose their color and turn gray or black. They are also very sensitive to bruising, so handle with care. When it comes to premium flower delivery Flower Explosion has one of the quickest times from cut-to-customer in the industry. There are no middlemen to mark our prices up. Our quality is superior and our prices are surprisingly reasonable— we don’t offer cheap flowers, just good prices. Order your wholesale anthurium today at Flower Explosion!